It’s no secret that using analytics to uncover meaningful insights from data is crucial for making fact-based decisions. Now considered mainstream, the business analytics market worldwide is expected to exceed $50 billion by the year 2016.1 Yet when it comes to making analytics work, not all organizations are equal. In fact, despite the transformative power of big data and analytics, many organizations still struggle to wring value from their information. The complexities of dealing with big data, integrating technologies, finding analytical talent and challenging corporate culture are the main pitfalls to the successful use of analytics within organizations. The management of information – including the analytics used to transform it – is an evolutionary process, and organizations are at various levels of this evolution. 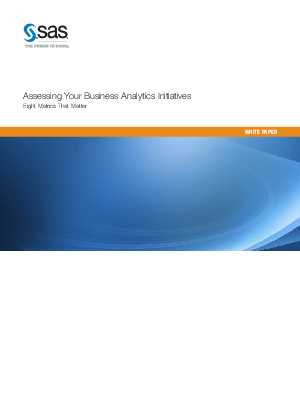 Those wanting to advance analytics to a new level need to understand their analytics activities across the organization, from both an IT and business perspective. Toward that end, an assessment focusing on eight key analytics metrics can be used to identify strengths and areas for improvement in the analytics life cycle.